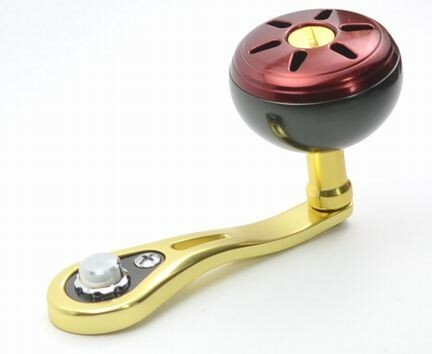 Handles on this page accept 7mm main shafts, which is employed by all Shimano bait casters 50-400 size, except following reels. 1. Shimano old Bantam reels. 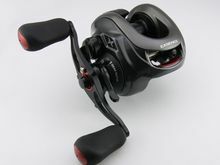 Shimano 00/15Conquest 300-400, TE/TE-GT 300-400. They have 8mm shafts. 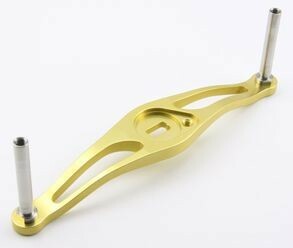 Please pick handles for Daiwa/ABU which accept 8mm shaft, and M8 hooded nut. 2. Calcutta D series 2012- Out side drag model : Please choose specified handles. 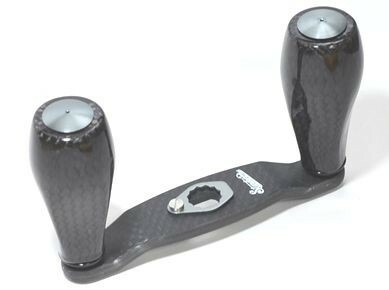 Power gripping 102mm swept, aluminum frame, EVA knob handle. All Shimano bait casters 50-250. Calcutta CT50-400. Swept star drag needed. Comes with retainer and screw. No handle nut is included. Shimano CT200 ball bearing installed handle. 84mm. No retainer or screw included. 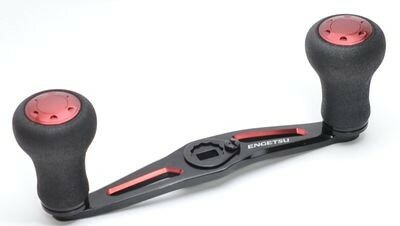 Sway back, Extra Super Duralumin(ESD) handle frame fitting to almost all Shimano bait casters. Avail handles are the piece of craftsman-ships. It is super light weight. 85, 90, 95, 100, 105mm, weight 13.2g 100mm. Color: Champaign gold, gunmetal, black. Fits to: Shimano 50-250 reels. Sway back star drag is not needed to fit this handle, except for 00Conquest50-200. 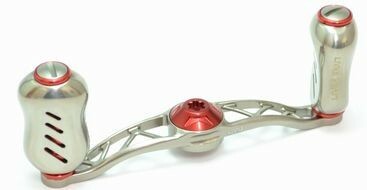 Please purchase additional 0.5mm washer for some models to adjust gap between star and handle. It is listed at the end of this handle listing. You may install both Shimano A and Daiwa S knobs to this frame. Retainer washer in the same color as handle frame and screws included. 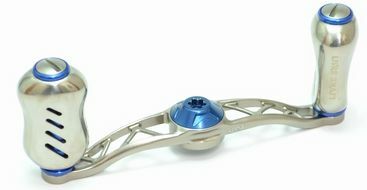 100mm swept, machined aluminum frame, titanium knobs. 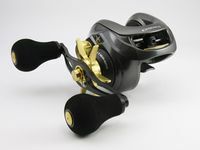 All Shimano bait casters 50-250. Calcutta CT50-400. No sway back star drag needed. Red, Blue and Gold. Please specify right or left. 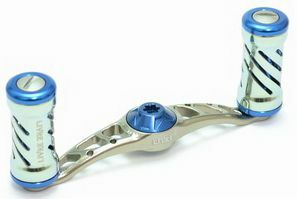 90mm swept, aluminum billet frame, titanium knobs. All Shimano bait casters 50-250. Calcutta CT50-400 No sway back star drag needed. Red, Blue and Gold. Please specify right or left. 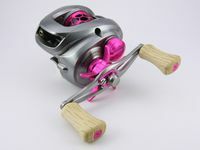 85mm swept, aluminum billet frame, titanium knobs,Sample All Shimano bait casters 50-250. Calcutta CT50-400 No sway back star drag needed. Gold, Blue and Red. Photo is red. R for right hand, L for left hand. 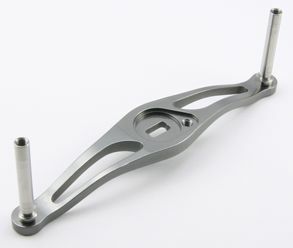 Machined from air craft grade Extra Super Duralumin (ESD), installed with machine-cut titanium knob shafts, the Avail handle is the piece of craftsman-ships. 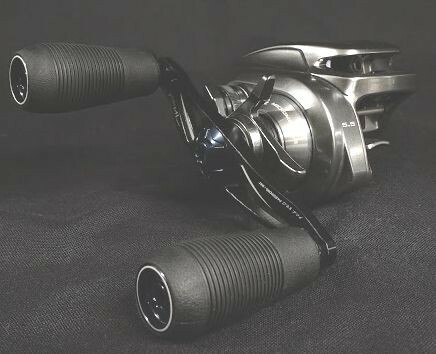 80, 85, 90mm Shimano Calcutta D 100 200 sized models. Kit includes screws, washers. 2 holes for 100, 2 holes for 200. Accept Shimano A, Daiwa S knobs. Long 102mm handle for Shimano Calcutta D 100 200 sized models. 2 Ball bearings installed. Kit includes Calcutta D300 handle, retainer ring, roller tube, screws, washer. 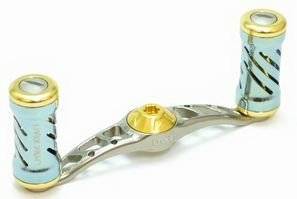 Power handle for Shimano 50-250 sized models, and CT50-400 reels. 2 Ball bearings installed. Kit includes handle and a retainer washer. 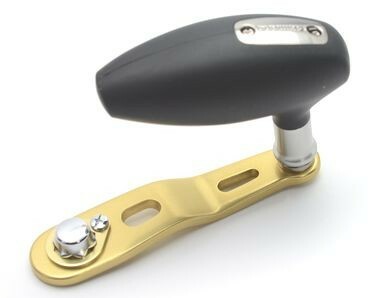 Single Power handle for Shimano 15 Conquest 300/301/400/401, 00 Conquest 300/400/401, Calcutta TE(TE-GT)300/400/401. 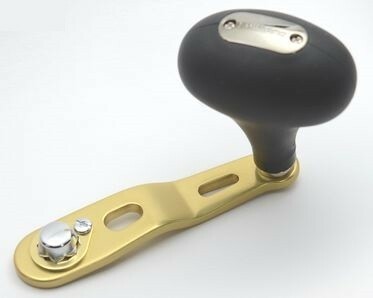 This 70mm long power handle has egg shaped large knob for better grip, and the long arm allows you smooth strong cranking. Kit includes handle, a retainer washer and screw. 2 Ball bearings installed. Dimensions: 8mm shaft, 11mm hex nut. 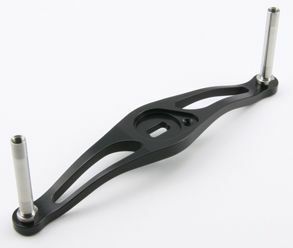 You may fit this power handle to other Shimano, Daiwa and ABU reels with 8mm main shaft by purchasing 11mm hex nuts. 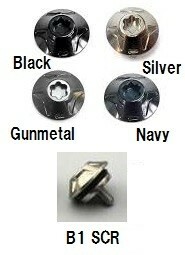 11mm hex nuts are used on the reels listed above, and other reels have 10mm hex nuts. 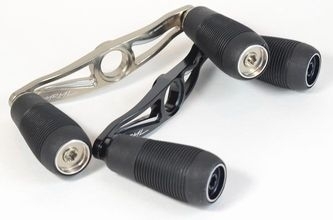 Single Power handle for Shimano 15 Conquest 300/301/400/401, 00 Conquest 300/400/401, Calcutta TE(TE-GT)300/400/401. 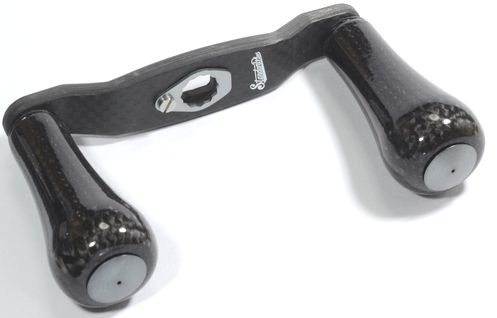 This 70mm long power handle has an ergo grip, and the long arm allows you smooth strong cranking. Kit includes handle and a retainer washer. 2 Ball bearings installed. Dimensions: 8mm shaft, 11mm hex nut. You may fit this power handle to other Shimano, Daiwa and ABU reels with 8mm main shaft by purchasing 11mm hex nuts. 11mm hex nuts are used on the reels listed, and other reels have 10mm hex nuts. 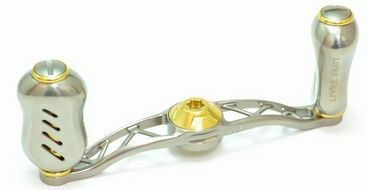 0.5mm handle washer to adjust gap between handle and star drag, for Shimano. To install Avail ESD STi2 handle. Retainer screw for Avail ESD handles. Made of 64 Titanium. Chrome, Black, Right for right handle model, Left for left handle model. 11mm hex nuts to fit handles for Conquest 300/400 models onto other reels. 8mm thread.